Getting trapped in a lift at a sci-fi convention with a fading star of a creaky old show, an extra dressed as a half-robot, half-crab and an over excitable fan of said science-fiction show might not be your idea of fun, but you’d be surprised how profound and human Keith Temple’s new black comedy Suspended in Space turns out to be. As a writer for Doctor Who (amongst other shows), Temple has been well-placed to judge what the convention scene is like. His choice of setting is inspired. By taking a cross section of the typical convention attendees (the star, the bit part and the fan) and trapping them, you get a microcosm of this strange world. In another guise, I also attend many conventions and both Temple and director Phil Dennison convey a wholly authentic experience. Often funny, sometimes painful, Suspended in Space is about as close as you can get to attending a convention without having to go. That isn’t to say that it is exclusively for ‘geeks’, far from it. The gags are fast and furious and as we delve into the backgrounds of this unlikely trio there are some surprisingly profound and dramatic moments for a comedy set at a sci-fi convention surrounding a TV show that ran for 24 episodes thirty years ago. Julia Nelson’s turn as the high-maintenance Jen is both hilarious and touching. As the ‘star’ of the show she is aloof and cool to everything around her, but quickly the mask begins to slip to reveal another dimension to this high-maintenance character. Dave Dutton should be applauded not only for appearing costumed as a half robot, half crab (complete with helmet and wavy tentacles) but providing a complex picture of the type of actor you often see at sci-fi conventions – the one that believes the fans love him, but in reality are sick of their same old tired stories. A touching segment about his post Suspended in Space career is sensitively handled by Dutton. Rounding off the trio is Sean Mason whose Gregory is the overexcited fan caught in the mayhem. As the socially inept Gregory, Mason’s comedic skills come to the fore with some great one-liners and observations. Yet, I defy anyone not to be touched by his emotionally charged reasons for being so enthusiastic about the show and the gentle way that Mason plays this. And it is this clash of cultures that feels so utterly real about Temple’s script. In jokes aside, there is a very human core at the centre of the story. I’ve been at conventions and met these people, and been shocked by their apparent lack of social candour only for them to drop some life-changing incident that makes you understand why they need to be accepted into a family of misfits. Genuinely uplifting, Suspended in Space mines the ripe setting of a sci-fi convention to produce a story that on the face seems comedic, but in truth takes you to dark places you could never have imagined three characters stuck in a lift could have done. Wonderful. 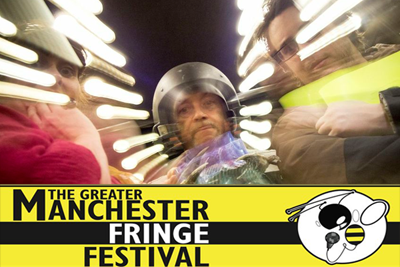 Suspended in Space runs until 10 July at the Lass O’Gowrie, Charles Street as part of the Greater Manchester Fringe. ← Stroker’s Picks: GM Fringe Week 2 & Nowt Part Of Festival!